Are you trying to figure out what events there are in Gaborone over April? We like to keep you in the know so we have done our monthly roundup for you. This month there is a lot going on, from markets to plays to races. These should keep your family busy on the weekends, but if you’re looking for things for your kids to do during the week have a look at our roundup of Holiday Programmes. 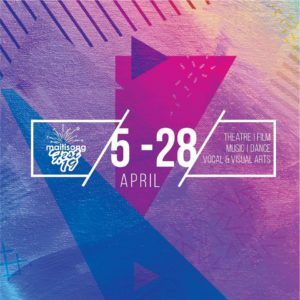 Maitisong Festival 2019 is scheduled for April 1st – 28th in Gaborone, Botswana. As usual, the Festival will showcase brilliant local and international shows to provide an unforgettable experience for all. With a varied and exciting line-up of events, there will be both free and paid shows to ensure that everyone gets a piece of the action. New parents and parents-to-be are in for a treat. 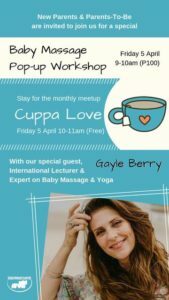 SensoBaby is hosting this workshop with an international baby massage trainer. The workshop is ideal for new parents and parents to be. Take along your young baby (under 12months) For some pampering. Booking is essential. After the workshop why not join Cuppa Love. It starts at 10:00 and is a FREE event designed to bring mums together and experience for yourselves the positive effects of love and connection in the community. -Demos and classes including HIIT, Fitmama, Rugbees, Monkeynastix, Yogabess and M&M Dance Co.
For more information call 75935900. 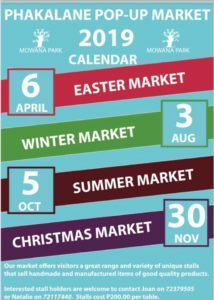 The Phakalane pop-up market is back. This is a firm favourite in the competitive ‘market’ event category. They’re also only doing 4 in a year now so it should be bigger and better than most. It has plenty of stalls and a discerning dislike to plastic tat. They’re also giving out some free Easter eggs to kids. Insider tip: Parking can get busy so we like the earlier arrival. Since its inception in 2013, this annual run has been the perfect wellness opportunity for corporates and the running community in Botswana. 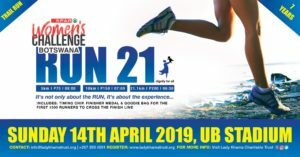 As with all LKCT fundraisers, this is a non-qualifying charity run with no prize money and due to the nature of it being a Trail Run, it is unique in the race calendar. The race starts and finishes at the University of Botswana Stadium (venue sponsor). The route is slightly modified annually as it is restricted by urban developments and weather conditions. 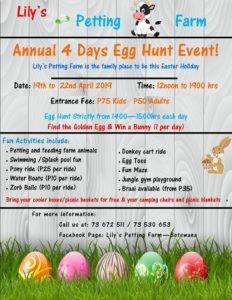 Why not join Lily’s Petting Farm during the Easter holiday for some farm fun. Please note the time for the Egg Hunt activity every day as that is not to be missed. Bring cooler boxes and picnic baskets for free. Also don’t forget swimming costumes, camp chairs and picnic blankets. The Easter Holidays are approaching so why not celebrate them with some animals at the BSPCA? 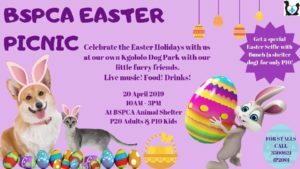 This year the BSPCA will be hosting an Easter Picnic at the new Kgololo Dog Park. This is a picnic event for you and your family to enjoy whilst listening to relaxing and soothing live music. Bring along your picnic blankets. Bring baskets for shopping at the stalls that will also be there. This event happens every week and it is gaining popularity every time. It’s a well organized and timed event. The real athletes can race off into the distance whilst others can simply walk. 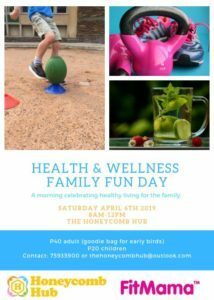 Kids are welcome to join in the fitness fun and lots of parents bring their strollers along. This is a great family event plus it’s FREE. To join you simply register online at www.ggc5k.com and rock up before the shotgun start at 5:30 pm. If you want more information to have a look at our blog post about the event. We hope all these events have shown you some fun places for you and your family to go to over the month of April. If we’ve missed any out please leave us a comment and let us know. We’re only as strong as our community. As always, please SHARE this post with your friends and keep everyone in the know. 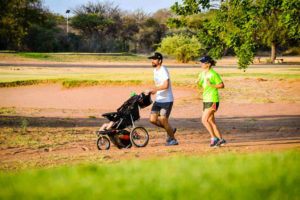 Connecting parents so they're in-the-know about family friendly Botswana. Hi. We have an Easter Market at Basilico on Sunday 21st April. I am creating the event page on FB later today but can you send the poster. Please include us. Thank you. Great, Julia please send it through.